Much as we're pleased to see Canon finally pushing forward in the compact system camera market, it still just seems too shy to let loose and throw everything it has at the category. The M5 is a step forward for Canon internally, but it's nothing for the competition to worry about. It's fair to say we've been highly critical of Canon's compact system camera EOS M line. For a simple reason, though: the Japanese company's mirrorless cameras simply haven't been able to stand up to the competition. And with the current line-up - think Fujifilm X-T2, Panasonic Lumix G80 and more - rapidly advancing, it's a camera-eat-camera world. Has that just changed with the Canon EOS M5? The redesigned interchangeable lens model - which sits above the entry-level M10 and middling M3 (yep, it's an odd numbering convention that makes no sense) - is, in many respects, like a "mini 80D" DSLR (which we loved) and, finally, offers a focus system that's actually usable. So does Canon have what it takes to stand out in the bustling compact system camera market? Having experienced the M5 in person, it feels like a surge forward within Canon's own rankings, but it's still a step behind its competition for a variety of reasons. The most critical aspect of the M5's specification is that it offers Dual Pixel CMOS AF - the same technology as found in the top-end Canon EOS 1D X Mark II pro DSLR - to deliver on-sensor phase detection autofocus, paired with contrast-detect autofocus. And it genuinely works well. It's quick and doesn't need to hunt excessively to find focus. Finally, then, Canon has an M-series camera with acceptable autofocus, so we can pretend the rest of the EOS M range doesn't exist. But is it the best autofocus system in any compact system camera? Not by a long stretch. It's not nearly as versatile as the EOS 80D's viewfinder-based setup, as the M5 only delivers a zone (1-point - but not very detailed in terms of size/precision), smooth zone (multiple points across a larger defined area) or face detection with tracking (to follow subjects). For a camera priced at over £1,000 this feels all too much like the company's point-and-shoot compact-style setup. Which doesn't cut it. What really puts the Canon in its place are the variety of other cameras in this market. Take Panasonic's pinpoint autofocus option (which zooms in to 100 per cent at a cross-hair focus for absolute accuracy), for example, in any of its G-series cameras (such as G80); or consider the Fujifilm X-T2's ultra-complex and customisable continuous autofocus abilities. In its favour, however, the EOS M5 does come with a 24.2MP APS-C size sensor - that's a larger size than you'll find in Panasonic/Olympus Micro Four Thirds cameras - which is reflective, again, of what you'll find in the EOS 80D (the two Canon sensors are different, though). The image quality is generally decent, but the higher ISO sensitivities aren't shy of displaying a fair degree of image noise. More than we were expecting, given Canon's strait of other top-quality cameras. Some imagine aficionados will prefer this subtle processing to give more room within raw files. We'd prefer a more balanced approach really. Part of the issue with image quality arises from the 15-45mm EOS M kit lens: it's not as optically sound as Canon's top glass, with visible distortion and blurriness towards the edges of the frame. It's only about an extra £100 on top of the camera's body, mind, so we're not surprised. Interestingly there are heaps of Canon EF lenses that can be used with the EOS M series. Well, if you buy an adapter (it's free with 18-150mm until end-of 2016, also free with 15-45mm until mid-2017). Problem is that adapter adds mass and lenses protrude further from the body, which is unavoidable given their design. We were given a 50mm f/1.8 EF lens for this review, but the sheer size it added to this small body didn't appeal - especially when we wanted something wider-angle. But there is potential for versatility; although just buying an 80D would be a simpler approach. Anyway, back to EOS M's capabilities. The M5 is the first interchangeable Canon camera to implement Digic 7 processing. It's super-fast, hence the camera can handle a decent burst rate of 7fps in continuous autofocus, increasing to 9fps at a fixed focus point. With the right SD card on board the buffer is significant too, avoiding clogging-up after taking just a handful of images (it can shoot 26 JPEGs at 9fps consecutively). That might not be the Fujifilm X-T2's 11fps capability (once paired with its optional battery grip, anyway), but the EOS M5 is a much smaller camera by compare. It's almost cute by design - like an altogether more capable (and mirrorless) EOS 100D replacement, which makes sense. Shoot in good light and you'll get yet better results, handled subtly. There's no giant crank of contrast or excessive push of colour, giving a real-to-life look that is muted compared to many of its competitors. Looks good to us though. There are some interesting points about the M5's design. Unlike previous models in the range it's aimed at users who want more control, who might otherwise contemplate a DSLR but seek something smaller. The M5, then, is exactly what we thought missed in the M-series lineup in its initial stages. There are dual thumbdials for making those key adjustments, a lockable mode dial, programmable function buttons, even a rather nifty "dial func." button atop the rear thumbdial to toggle between various settings, which are then attributed to that specific dial (ISO and white balance are default, but it can be switched off, or set to toggle through AF, metering and burst mode additions). It's similar to Olympus's 2x2 switch in some of its OM-D cameras, such as the E-M5 II, but as Canon positions it directly on the specific dial it's a bit simpler to navigate. The M5 also comes with a tilt-angle 3.2-inch LCD touchscreen, which can be flipped out all the way underneath the camera for selfies (again, a bit Olympus-like: hello E-PL7), or upward for waist-level work. The addition of touch controls is a big point, as it empowers the autofocus potential (without being disruptive due to accidental presses - it needs to be addressed firmly). It also introduces a drag-to-focus feature. This is the ability to press-and-drag a finger on the rear screen to adjust the focus point whilst using the camera's built-in viewfinder. You can specify the whole screen, half screen, or any quarter of the screen to be active, with the point absolute or relative, for the best possible control. Olympus may have had the idea first, but Canon makes it all the more usable. Speaking of the viewfinder, the EOS M5 has a 2,036k-dot OLED panel, which not only looks sharp but will keep action flowing beautifully thanks to its 120fps refresh rate (which can be halved in the settings to save battery, if you so wish). And, speaking of battery, you'll want to really watch your use with the M5. If left in its "on" position by accident the camera won't automatically time-out, leading to battery death in little time. Multiple occasions when away on a work trip we pulled the camera from a bag to find it had zero battery. Very annoying. It's a 4K world these days, with the likes of Panasonic, Fujifilm and, well, just about any maker pushing 4K movie capture. Not so with the Canon EOS M5: it's limited to 1080p60 instead. Which is fine, but given that the camera could handle 4K, its absence seems amiss. There's a 3.5mm microphone socket, but no headphones jack. 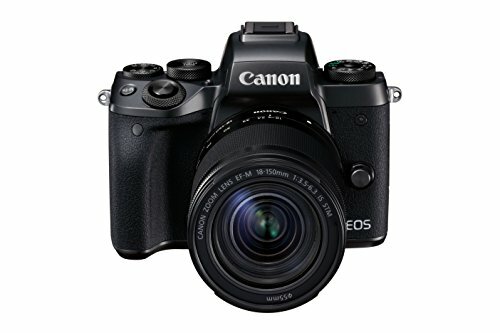 So if you're looking for a miniature interchangeable lens camera for high-end video work, ultimately the EOS M5 isn't the one. It's all about casual shooting, with touchscreen autofocus adjustment making that just fine and dandy. The M5 also supports Bluetooth LE (low energy), which bubbles away in the background (or not if you turn it off) for remote control of the camera via the associated smart app on a phone or tablet. This is a pretty smart move, as the constant connection and re-connection of cameras when it comes to smart apps is overly fussy. If you find much use for remote controlling the camera in the first instance, that is. The Canon EOS M5 is the mirrorless camera the company should have launched years ago. It's taken far too long for the Japanese maker to catch up with the competition. And even now, the M5 couldn't be called the best thing going. While the M5 does pull in some aspects from the excellent 80D DSLR, it seems to not only condense but sort-of dilute those features. Battery life problems, limited autofocus control and a so-so build (in terms of feel rather than actual quality) at this price point are questionable. And that's a huge part of the M5: its £1,049 body-only price is trying to make a statement, but it simply can't match the capability of the £1,399 Fujifilm X-T2 or the competitive £699 price point of the Panasonic Lumix G80. Both those examples have better build on balance at their respective price points, plus bigger and better features such as 4K video capture and more comprehensive autofocus. So as much as we're pleased to see Canon finally pushing forward in the compact system camera market, it still just seems too shy to let loose and throw everything it has at the category. The M5 is a step forward for Canon's EOS M range, but it's nothing for the competition to worry about. Add that an EOS 80D can be bought for less money makes it all the more nonsense too. If you're looking for that mini-DSLR style but don't want to break the bank then the Panasonic stable is a good place to go. The G80 has heaps of features, great autofocus capabilities, 4K video, plus it's a heap cheaper than the Canon. A no brainer by comparison. Ok, ok, so the Fujifilm is an extra £350 over the M5. But it's a much better built and more advanced beast. It may not have the degree of lenses available from day one, but what there is is decent. We think image quality is preferable too. We called it the "mid-range master" because Canon's near-£1,000 DSLR is so capable. Sure, the M5 does pull some of this excellence into its smaller body, but for our money the DSLR option is the better one any day of the week.